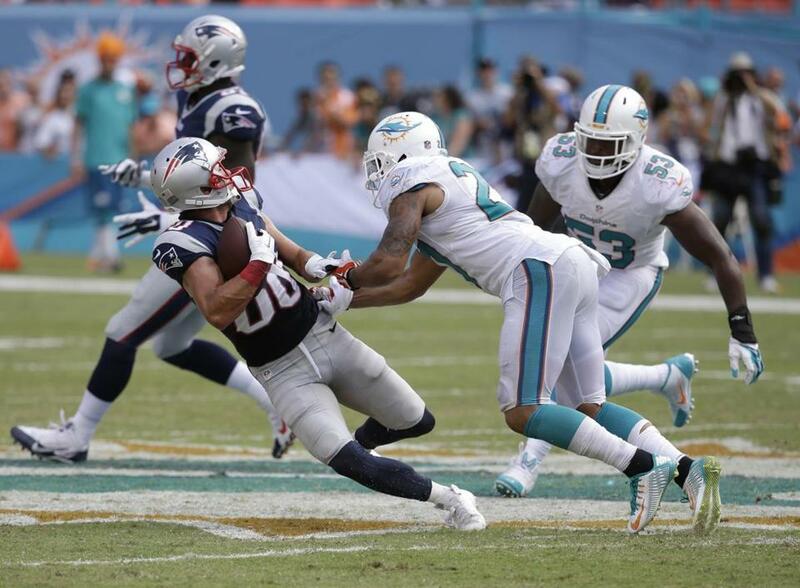 Patriots receiver Danny Amendola has just three catches through two games, all in the opener against Miami. Danny Amendola couldn’t have been more wide open. It was third and 6 in the first half of the Week 1 game at Miami. Starting from the right slot, he ran exactly to the first-down marker at the 14-yard line and cut inward, streaking across the middle of the field. The closest defensive back was 4 yards away and didn’t have a good angle. Tom Brady had a clean pocket and plenty of time to read the field. All he had to do was deliver a quick pass over the middle and Amendola could have had at least a first down, if not a big catch-and-run. It didn’t matter. Brady never looked at him. Brady instead heaved the ball up to Rob Gronkowski in double coverage in the end zone. Gronkowski, tightly covered, had no chance of catching the pass. The ball fell harmlessly to the turf, and the Patriots had to settle for a field goal. That’s been a common theme for the Patriots’ offense through two games. Gronkowski and Julian Edelman have gotten a lot of Brady’s targets — 32 of 77, or 42 percent — while the other receivers and tight ends have been little more than decoys. Brought here last year to be Wes Welker’s replacement, Amendola instead has been the invisible man in the Patriots’ offense, as Edelman has stolen his thunder. Amendola has three measly catches for 16 yards through two games. He played all of 18 snaps last week against the Vikings, with no catches and just two targets (one called back by penalty). It’s a continuation from the end of last year, when he had one pass thrown his way in the AFC Championship game, which he dropped. On the surface, Amendola looks like yet another receiver who can’t figure out the Patriots’ offense and get on the same page with Brady. That’s certainly not what the Patriots envisioned when they handed him a fat five-year contract last offseason, which in practical matters will pay him $12 million over the first two years. Brady was pragmatic last week when asked about his trust level with Amendola. But Brady’s true feelings on his receivers aren’t hard to decipher. So, obviously, there’s a disconnect between Brady and Amendola — one they haven’t been able to figure out after spending two full offseasons and one-plus regular season together. So, how is practice going? Amendola is taking a lot of flak from fans for not being able to pick up the Patriots’ offense, but that’s not completely fair to him. After rewatching every snap this season on the All-22 coaches’ film, Amendola isn’t exactly the second coming of Steve Largent, but he has been open a few times, especially in the first game against Miami. It’s not like Amendola is a rookie who can’t adjust to the NFL. He came to the Patriots with a proven track record. His issue was staying healthy, not catching the football. Amendola had seasons of 63 and 85 catches with St. Louis, and that was with Sam Bradford throwing him the football. So, is it really all on him? Amendola isn’t the only receiver being ignored by Brady, either. Brandon LaFell was a consistent producer for four years in Carolina before signing with New England in the offseason, catching between 36 and 49 passes each year and surpassing 600 receiving yards in each of the last three seasons. But after being given $3 million guaranteed by the Patriots this offseason, LaFell doesn’t have a catch through two games. He wasn’t even targeted last week against the Vikings, as LaFell, a physical receiver at 6 feet 3 inches and 210 pounds, was used almost exclusively as a blocker in the run game. LaFell wants to catch passes, not block a safety. Certainly, Amendola, LaFell, Aaron Dobson, and Kenbrell Thompkins need to keep working harder in practice to gain Brady’s trust. But Brady needs to have a little more faith, too. If Bradford and Cam Newton could get Amendola and LaFell the ball, then Brady should be able to, as well. He stressed all offseason that he wants to play like the San Antonio Spurs, a team with a lot of contributors and no superstars. Instead, the Patriots have been like the Knicks, with Brady force-feeding the ball to Carmelo Anthony (Gronkowski). Or like the Thunder, with Gronk playing the role of Kevin Durant and Edelman as Russell Westbrook. But let’s not put this all on Brady, either. The offensive line plays a big role in this. Whenever Brady took a five-step drop against Miami, he was swallowed whole by the Dolphins’ pass rush. Against the Vikings, the Patriots went run-heavy to keep the pressure off Brady, and whenever they did throw, Brady got the ball out of his hands quickly. It was all bubble screens, play-action passes, and hot reads to Edelman and Gronkowski. They needed trickery and deception just to keep Brady clean and give him time to throw. So the answer is clear — everyone needs to improve. Amendola needs to do a better job of getting open and being in the right spot. Brady needs to do a better job of scanning the field. And the offensive line needs to do a better job of blocking. Otherwise, Amendola will remain an invisible, expensive decoy.